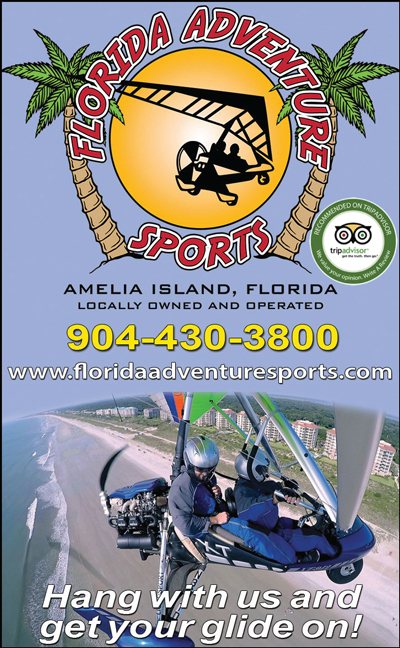 Powered hang gliding with Florida Adventure Sports is like nothing you have ever experienced before. Be as free as a bird soaring over the majestic landscape, take in the magnificent sites of Amelia Island, Fernandina Beach, Jacksonville or Cumberland Island, Georgia. Their FAA certified flight instructor has over 30 years' experience - so you can trust you are in good hands. They offer 20, 40 and 60-minute sessions of hands-on flight instruction. To watch videos of their flights or get more information go to www.floridaadventuresports.com. 904-430-3800.